This Beef Ragu Sauce Will Transform Even The Most Basic Pasta Dish! Ragu is a sauce that’s been around for many centuries. In Italian cuisine, this is usually made with a braised beef or spicy pork and although some view it as a tomato-based sauce, it’s actually a meat-based sauce with only a small amount of tomato added in. Sprinkle beef wit salt and pepper then set aside. Preheat the oven to 300F. Process the pancetta and salami in a food processor until ground into a paste (about 30 seconds). Scrape down the sides of the bowl as needed. Add carrot, garlic, and celery and process an additional 30 seconds. Transfer the paste to a Dutch oven and set aside. Do not clean out the processor bowl. Pulse the onions in the processor in two batches until they form about 1/8″ to 1/4″ pieces. Cook the panchetta mixture over medium heat, stirring frequently, until the fat is rendered and a fond begins to form on the bottom of the pot (about 5 minutes). Add the tomato paste and cook, stirring constantly, until browned (about 90 seconds). Stir in 2 cups of water and scrape up any of the fond on the bottom of the pot. Stir in the onions and bring to a boil. Stir in 1/2 cup wine, the parlsey, and 1 tablespoon marjoram (or oregano if using). Add the beef and push into the onions to ensure the beef is submerged. Transfer to the oven and cook, uncovered, until the beef is fully tender (about 2 to 2 1/2 hours). Transfer the beef to a carving board. Place the Dutch oven over medium heat and cook, stirring frequently, until the mixture is almost completely dry. Stir in the remaining 1/2 cup wine and cook for 2 minutes, stirring occasionally. Use two forks to shred the beef into bite-size pieces, then stir the beef, red pepper flakes, and remaining 1 tablespoon marjoram into the sauce. Season with salt and pepper to taste. Remove from heat, cover, and keep warm. Bring 4 quarts of water to a boil in a large pot. Add rigatoni and 2 tablespoons salt. Cook, stirring often, until just al dente. Drain the rigatoni and add to the warm sauce. 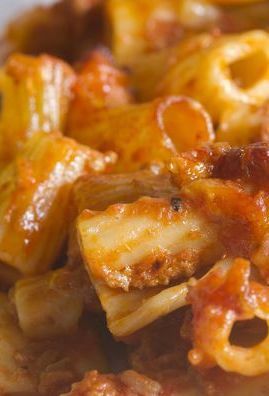 Add the pecornio and stir vigorously over low heat until the sauce is slightly thickened and the rigatoni is fully tender (1 to 2 minutes). Serve, garnishing with extra pecorino.